Check our latest reviews from Hulett Motel customers posted on TripAdvisor. I stayed in one of the chalets by the river and it was perfect for me. Clean and private, and Victoria was very pleasant and helpful. It's also within walking distance to town where there are several places to eat. I would highly recommend the Hulett Motel if you are in the area. Stay here, you won't go wrong. My wife and I stopped in on a road trip in early April. Perfect spot downstairs facing the river. Victoria was very friendly and took care of all our needs and visited a bit before retiring for the night. She even offered to fix us a light meal, though the cafe had already closed. The room was cozy and warm, all we needed. Service like that is hard to find. What a great, friendly, clean and dog friendly place. When we stopped by last minute for a place to crash the people there were so helpful. I will love to go back here again when I am back out this way. Also the food next door...delish! Family-run facility with very nice recently updated bathrooms. Belle Fourche River runs through the backyard, offering a peaceful location for end-of-day wind down. Great for self-sufficient travelers just passing through or as base for surrounding activities. Room Tip: Rooms on the back are closer to the Belle Fourche River; rooms on the front are more accessible. On a tour of SD, WY, MT, headed to SLC. After a long day of visiting Deadwood, Sturgis and Devil's Tower, we needed beds! We found them here! A large room with 2 doubles and a twin; a tv with cable, AND wi-fi!!! Woo hoo! The beds are beautiful log beds with comfy quilts! No complaints at all. Wish we could stay longer but we've got more miles to cover. We found the Hulett Motel to be a nice relaxing stop after the drive from Cheyenne. Our room had a porch overlooking the lawn and the creek. We enjoyed sitting out there until sunset. There was a BarBQ grill so we elected to go to the grocery store across the street. Get a steak and grill it. Very relaxing end to a day. The room was clean equipped with a refrigerator and a microwave. Staff was friendly and we got a breakfast discount at their adjoining restaurant. Room Tip: The rooms down by the creek are private and quiet. The hotel photos on the site show the outside of the creek side two bedroom places. This motel has the sweetest little rooms at such a great price. Two beds but plenty of room. The bathroom had been upgraded beautifully and was plenty roomy. The decor was rustic and homey feeling but what struck me the most was how clean it was. The office is next to a cute little diner and their service and food were top quality. You didn't have to be a townie to get great service. We have stayed here a couple times now. It's only an hour from home but it is the PERFECT get away and relax spot! The rooms are cozy, the new management and staff is just the most adorable gal who has the biggest heart, and the restaurant attached to it has wonderful food! If you stay in a riverside suite there are chairs to relax in front of the river and a bbq grill available for use. I seriously love this place. We are not hunters but this place is set up for hunters, they even have a game pole for the convenience of hunters. I like to play in photography and the turkeys even come in along the river right in front of the rooms! This is the perfect place for just a quick get away from it all weekend or a nice family gathering. The town of Hulett is so quaint and friendly. Room Tip: Cabin 14 is beautiful and room 6 and 8 are my favorites! All rooms have microwaves and refrigerators as well as heat and air conditioning. Very nice clerk checked us in and 10 minutes later we are sitting on a bench between our little chalet and a small river. We are facing in the direction of Devils Tower but will have to drive out of town a bit to see it, but that is ok. After traveling since early morning, this place is a nice quiet oasis for these weary travelers. Room Tip: Rooms in the main motel are fine but the chalet cabins are so darned cute and a few dollars more. Stayed there for a one night stay on the way to Devil's Tower in mid July. Can't say enough good things about this place....it's an excellent place to stay. Clean, up to date, quiet, rooms are cozy, but big enough for us (family of 6). The place is just awsome, it's got a really nice western charm about it too. Excellent value for the money. Would definitely recommend and stay again. Our favorite place we stayed during our two-week road trip. Very near to Devil's Tower, and on the way to Mt. Rushmore when traveling west to east. Nicely decorated room, decent rates and a quaint restaurant with good food. We will stay there again if the opportunity ever presents itself again. Can't remember the last time I drove up to park right outside my hotel room! How convenient! For a moderate price, we have 2 double beds, nice beige towels and quiet. Very clean and personable staff. We were offered ice as soon as we checked in. Hulett Motel is a charming little slice of old fashioned charm and hospitality in close proximity to Devils Tower. The owners are very warm and friendly, and go out of their way to make you feel right at home. The old fashioned charm also comes with modern conveniences such as HDTV LCDs and DirectTV, so if you do decide to take some time away from the natural wonders that abound near Hulett you'll have plenty of choices available on the "tube". Our family of four stayed in the log cabin, and found it to be very comfortable and spacious. Again, can't say enough about the friendly owners. They really do work hard to make your stay comfortable. If we find ourselves in Hulett again this will definitely be our first choice for lodging. We spent 2 nights here to explore the WY side of the Black Hills on the way out west. The rooms are clean, comfortable, small town motel rooms. The motel is on the banks of the Belle Fourche River. The hotel grounds behind the main parking area are peaceful, and quite pretty with red cliffs across the water. We spent the evenings sitting out and watching the birds and deer. It is right next to the road, but down low enough that you don't notice the traffic (and it's a small town in a rural area so there isn't much!). The staff were friendly, efficient and a great source of local information. We'd stay here again. The negative reviews on TripAdvisor I've seen do it an injustice. Room Tip: Ask for a room or a cabin facing the water so that you can sit outside as night falls. 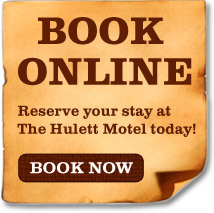 The Hulett Motel is a great place to stay! I am in Hulett frequently for work, and this is my go to place. The rooms are clean and comfortable. The staff is always great and extremely friendly. If you are in Hulett and need a place to lay your head, this is the place! Plus you can't beat the beauty of the Black Hills and the Hulett Motel is right by the river! After traveling all day & enjoying Devil's Tower we were looking for something close by. We saw the signs for the Best Western, but we drove by this place and it looked inviting. We stopped into the office & the young lady couldn't have been nicer that checked us in. Quaint, quiet & comfortable and affordable A frame cabin helped one of our last nights of travel to an enjoyable end. We would certainly stay there again! Copyright © 2018 The Hulett Motel, LLC. All Rights Reserved.